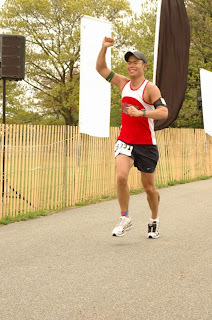 Two weeks after the Charlottesville Marathon, I decided to race the Long Island marathon. 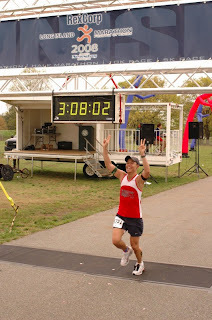 Yeah I can be pretty psychotic when it comes to racing, but the Long Island Marathon/Half Marathon event was too hard for me to pass up. Granted, the course can be monotonous, the crowd support is always amazing. Not to mention, the course is fast and flat as a result I thought it would be a good marathon after the super tough Charlottesville. To be honest, after Charlottesville, I was going to compete for the half-marathon. However, I figured I would give myself another 4-5 days to see how my body has recovered. After putting 22 miles after the marathon and 10 miles a week before and despite some soreness on the recurring left ankle and right hamstring, I decided to just go for it. As I have said before from my Charlottesville experience, I was pretty bummed after missing the qualifier by 50 seconds. However, looking back, the standards was a 2:50 back then and I should be happy with my time. 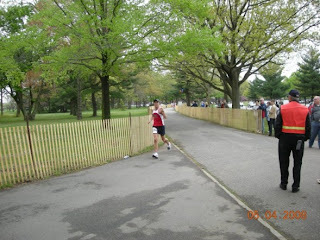 Hence boston schmoston.... ;P Going into Long Island, I decided to go for broke because of the flat course. I decided to try to get close to 7's till mile 20 (if i feel good) and ease into a steady 7:30-7:45 pace. Believe me, this was definitely NOT the way to go. 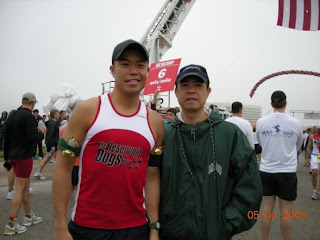 Marathons are extremely humbling because anything can happen and after 5 marathons, I've grown to RESPECT the distance and STILL HAVE A LOT to learn on racing a good marathon. Granted you can run a great 18 mile, but the difference between the 18M or 30K and the marathon is drastic. 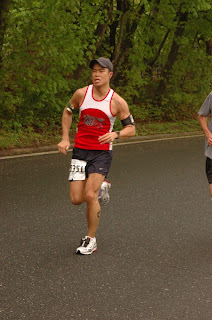 I felt great from miles 1-19 as I've paced with Peter Tadras who hit a 3:06 (we were neck and neck till mile 23). After mile 19.5, the headwind became pretty distracting and miles 23 featured a windy loop on the inclining overpass. 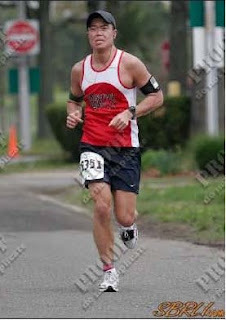 As soon as I got to mile 24, I knew I had a slight chance to PR from my 3:11:49 time. 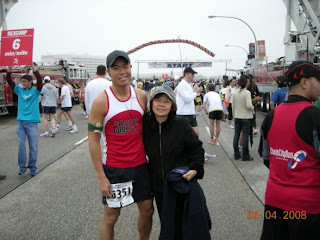 Mile 26 was pretty sweet as I saw my parents cheering for me. As soon as I saw the finished line, I clocked a 3:08 and net time of 3:07:43; I was relieved. I think the Charlottesville Marathon really gave me some belief in myself as well as the impressive Brooklyn Half marathon times from my team (congrats!) really inspired to pull me through. Thanks to sigeps, k, wongster, jud, reddog, nate, baldy and katie (her zen energy worked wonders!) for believing in me. One more thing, thank you IPOD (there's really nothing wrong with running with music); I owe you big-time! Lastly, a huge congrats to Anchi on her comeback 10K! Her next 10K, the Circle of Friends! Watch out! Nice job! Congrats on the PR. Moz - congrats on BQ. Where did you get chip-time results for the race? I can't find them online. great race morrissey! congrats on the pr!! Congrats! Where did you get your chip time? The Newsday website has the clock times only. Dude! You're a machine!!! very nice PR. nice marathon time, im with you on respecting the distance and still learning. I have a lot to learn still. Im looking forward to some flat races to where I can fly...those hills are for the birds! the 26.2 on a treadmill was BORING! My legs felt fine afterwards and I went icefishing right afterwards. It's funny, I ran it in like 3:11 and I wasn't even sore the next day...I peaked too early! Congrats Ken! I remember when you were fat!